I hope that you all had a happy holiday weekend. We watched fireworks, played outside, and ate a lot of great food. It was the quintessential summer weekend. I managed to squeeze in some walks. 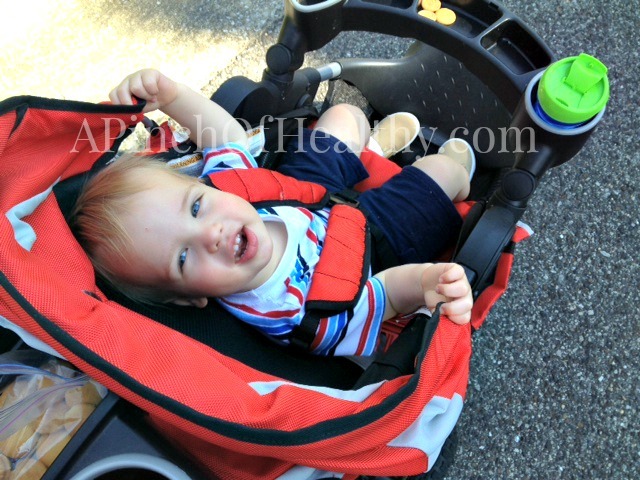 Although, I think my son has just about outgrown being strolled. He gets restless and fussy, and I know he’d rather have his feet on the ground. My meal plan is almost non-existent this week. We’ve got lots of family activities planned, so I will only be cooking Monday and Tuesday nights. Since I worked in a trip to Costco this weekend, those meals will mostly come from a store-bought rotisserie chicken. 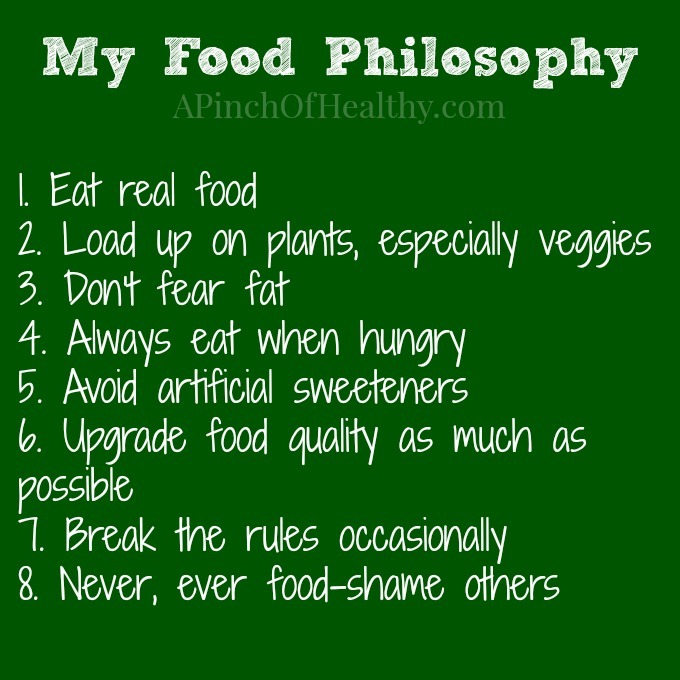 So instead of the usual meal plan post, I decided to share with you guys a few of my food rules. I hate the word rules, actually. So maybe I will call this my food philosophy instead. First, let me say that (1) I am not a doctor or nutritionist and (2) I am not perfect. I break every one of these “rules” at one point or another. My approach is to lean healthy most of the time as much as I can. These are meant to be practical tips, and the goal is not to be 100%, but just to use these as common sense guidelines. 1. Eat real food as much as possible. We lean toward things that are closest to their original form and minimally processed: fruits, vegetables, meats, fish, dairy, nuts, whole grains, etc. 2. Eat lots of plants. I try to put specific emphasis on lots of vegetables, but I also enjoy whole grains and fruits as well. 3. Don’t fear fat. This may set me apart a bit from the typical Weight Watcher. I do not like fat free stuff most of the time. I do some fat free Greek yogurt or skim milk sometimes. But I also work in the whole fat and part fat versions here and there. I also prefer full-fat cheese and full-fat mayo. I eat avocados, nuts, olive oils, chia seed, etc. I also take a DHA supplement to make sure I am getting adequate healthy fats. Your body needs fat. Fat helps you feel fuller longer, plus it makes stuff taste really good. I do avoid trans fats, and I try to focus on high quality fats as much as possible. 4. Always eat when hungry. Eating healthy to me means having a healthy mindset about food. Denying your body food when you are physically hungry can lead to a really messed-up relationship with food. It can put you on the crazy cycle. Even if I have to use weekly points, I am going to eat if my stomach is growling. On the flip side, realize that highly processed junk food can actually make you feel hungrier. If you change the types of foods that you eat, you can get better nutritional bang for your buck. AND you can feel more satisfied. Win/win! 5. Avoid artificial sweeteners. I am not 100% on this, but I have cut way, way back over the last several years. I used to drink two to three cans of diet coke per day. I am down to like maybe one a month, or one every other month. I find that now that it is out of my daily habit, I crave it less. Why do I choose to avoid it? There is some evidence that artificial sweeteners mess up your natural hunger signals, and they can cause you to feel physically hungrier. I am not one of those who think you will spontaneously combust if you drink a diet coke. There is a lot of alarmist misinformation on this topic, in my opinion. Always consider the source of your information. If I find myself really wanting a diet coke, I am going to have it. After phasing it out, though, I am finding that I want it less and less. I don’t buy sugar free desserts or anything like that. I’d rather have small bits of the full-fat, full-sugar version. I put real sugar in my coffee every day, and I have managed to lose over fifty five pounds while doing it, so I don’t think the small doses have set me back in my weight loss at all. 6. Upgrade food quality as much as possible. A big part of this is educating yourself on how food is made, and what is in it. I try to buy organic as much as our budget allows, and as much as practically possible. I love to shop at famers markets. Fresh, local produce is generally cheaper and better than the stuff in the grocery store. I am by no means militant, and there are still a lot of things we buy that are traditionally grown. Practicality and availability play a huge role. But the good news is that organic options are showing up a lot more (even Wal-Mart!). 7. Break the rules every occasionally. Rules are made to be broken every now and then…am I right?! Sometimes I am going to fall off the wagon and eat things that are highly processed, or that are just plain junk. As long as this is rare, and my daily habits are pretty clean, I am not worried about it. 8. Never food shame anybody. I get really put off when a feel like somebody is food shaming me, and I am sure many of you feel the same way. Food choices are highly personal. Educating yourself and improving is a journey, and everybody is on a different point in that journey. Do you have any food rules/ guidelines? What does eating healthy mean to you? Ah thanks Frank! I agree, and it sounds like our food philosophies are similar. And I don’t want to live in a world where I can’t enjoy the occasional reese’s PB cup. 🙂 For me, it is more about making sure my daily habits are really clean. It’s funny that this is your topic today. I was just talking to a friend about the “dietary rules” we all follow for success. Mine hadn’t seemed to be working so she was telling her “rules”. We decided that all the different diet books out there are really just someone else’s rules of what works for them. I’m working on finding the “rules” that work for me to be the most successful long term. I’ll be re-reading yours as I think about my own. Thanks for the post. So true Jennifer! My “rules” have evolved over the years, and I am sure they may continue to change. Lots of self-education, trial and error, tweaking, judging how I feel, etc. I think this is SUCH a great philosophy! I used to shun fat and eat a lot of processed food in college. Now, I try to eat more healthy fats and avoid anything processed. It helps a LOT and I find I’m not as hungry! My food philosophy has definitely evolved over the years, Liz. Like you, I used to eat a lot of processed food and avoid fat several years ago. The result was that I was always hungry! And it led to more overeating. Taking a more balanced approach helps me to feel more satisfied.